Clients appreciate my strong work ethic and solution-driven approach to closing deals and protecting their businesses. I help them avoid overcomplicating problems and understand not only how a particular strategy will resolve the issue at hand, but also how it will impact their entire business. 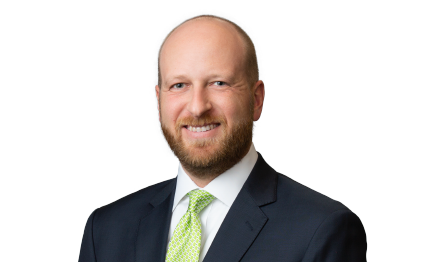 Brock Niezgoda is a corporate and transactional lawyer with a broad practice designed to handle the diverse needs of mid-size companies, family-owned businesses, publicly traded corporations, private equity firms and startups. He has experience negotiating and structuring a wide range of complex transactions from both sides of the deal, including mergers and acquisitions, financing transactions, energy-related secured lending, project finance and acquisition financing, and private and public securities offerings. Brock’s practice covers numerous industries, from midstream and upstream energy, oil and gas services and manufacturing to retail, healthcare, restaurant franchising and many more. In addition to his transactional practice, Brock advises management teams and business owners on a variety of general corporate and ongoing operational matters, including efficient entity structuring, reorganizations, corporate governance and formalities, SEC reporting and compliance issues, and resolution of internal issues between company stakeholders. Represented environmental remediation, waste storage, transportation and disposal services company in sale of a majority equity stake to a private equity fund. Represented Global Healthcare Alliance in its sale to Cedar Gate Technologies, a portfolio company of Chicago-based private equity fund GTCR. Represented the owner of trucking and saltwater disposal companies in the sale of entities to and creation of a joint venture with a national trucking company creating a new saltwater disposal company with trucks, pipelines and saltwater disposal wells in multiple states. Represented a Dutch-based company specializing in fire suppression products and services and aircraft safety component repairs for the commercial aviation market in the acquisition of an aircraft safety equipment provider and servicer with full-service facilities in Houston, Dallas, Indianapolis, Atlanta and Tampa. Represented a Dutch private equity firm in connection with the acquisition by one of its portfolio companies of a U.S. holding company and its U.S. and U.K. subsidiaries engaged in the business of providing horizontal directional drilling services and products. Represented publicly-traded midstream company in connection with its acquisition of salt water disposal wells and associated facilities in North Dakota. Represented the owner and operator of water gathering pipelines and disposal facilities in the development of a $100 million strategic financial partnership with a credit-oriented private equity firm. Represented agents, lenders and borrowers in oil and gas reserve based financings, including acquisition financings and financings secured by both onshore and offshore properties. Represented agents and lenders in project finance transactions, including the development of a crude loading terminal and solar power generation facilities. Represented NYSE company in acquisitions of 77 convenience stores in New York and 22 convenience stores in Texas. Represented borrowers in industries including oil and gas exploration, manufacturing and chemicals in negotiating term loans, revolving credit facilities, second lien financings, working capital facilities and other financing arrangements, both in the U.S. and internationally. Represented project developer and private equity fund in funding and development of North Dakota rail terminal. Represented numerous privately held companies in acquisitions by private equity funds and strategic buyers. Represented management team in recapitalization of company by multiple private equity funds. Represented publicly traded company in PIPE transaction and subsequent S-1 registration statement filing. Represent and advise publicly traded companies with respect to SEC and exchange reporting and compliance issues.